Tilly Edinger (1897–1967) was a German palaeontologist who founded modern palaeoneurology (the study of fossil brains) in the 1920s and for the first time discussed problems that still form the basis of palaeoneurology. Johanna Gabrielle Ottilie “Tilly” Edinger was born into a Jewish family in Frankfurt, Germany in 1897. Her father Ludwig Edinger (1855–1918) was a neurologist who founded Frankfurt’s first neurological research institute. Nevertheless, he did not support Tilly’s early interests in neurology because of her gender. She was educated at home by French and English governesses until the age of 12, after which she attended Frankfurt’s high school for women, the Schiller-Schule. Figure 1. Edinger measuring an endocranial cast in 1926. Image reproduced with the permission of the Museum of Comparative Zoology, Harvard. Edinger took classes in geology, zoology and palaeontology at Heidelberg University and the University of Munich, and received a PhD in natural philosophy from the University of Frankfurt in 1921. Her dissertation topic was a detailed study of the skull and cranial cavity of Nothosaurus, a long-extinct marine reptile of the Triassic era. Her research focused on endocasts of fossil crania, which can reflect in detail external brain anatomy. The description of the Nothosaurus specimen was the subject of Edinger’s first publication in 1921. Immediately following her dissertation, Edinger worked as an unpaid volunteer at the Geological-Palaeontological Institute of the University of Frankfurt (1921–1927). She continued her scientific work at the same university in another unpaid position, this time as curator in vertebrate palaeontology at the Forschungsinstitut und Naturmuseum Senckenberg (1927–1938). This provided Edinger with access to the collections, allowing her free rein to extend her palaeontological education and spend time studying vertebrates. During her years as a curator, Edinger wrote “Die Fossilen Gehirne” (Fossil Brains), a landmark study which was based on her discovery that mammalian brains left imprints on fossil skulls, allowing palaeoneurologists to reconstruct the neural anatomy of ancient mammals. Figure 2. 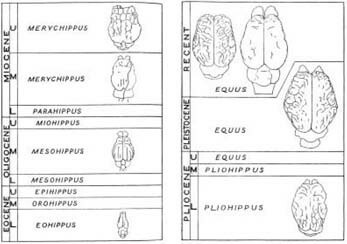 Edinger’s series of horse brains, showing differences in size and external anatomy as well as order of stratigraphic occurrence. From ‘Letters from Gondwana: Tilly Edinger and the study of “Fossil Brains” ‘ (Edinger 1948). In 1933, the rise of the Nazi Party in Germany radically changed Edinger’s personal and scientific life. She retained her curatorial position for five more years, but in 1938 was dismissed, shortly after which she emigrated to England (May 1939). While in London, Edinger worked as a translator but continued her research and published three palaeoneurological papers in English and French. Edinger applied to the US Consulate for entry into the Unites States and was issued quota number 13,814, for planned entry in the summer of 1940. Edinger’s US colleagues provided important support for the visa process, including a letter from George Gaylord Simpson to the State Department which stated: “She is a research scientist of the first rank and is favorably known as such all over the world. She is everywhere recognized as the leading specialist on the study of the brain and nervous system of extinct animals and on the evolution of the gross structure of the brain. She is so preeminent in this field that she may really be said to have created a new branch of science, that of paleoneurology, a study of outstanding value and importance”. Edinger arrived in New York on 11th May 1940 and soon thereafter relocated to Massachusetts to take a position at the Harvard Museum of Comparative Zoology; this represented her first position as a salaried palaeontologist. Edinger attended the founding meeting of the Society of Vertebrate Paleontology (SVP) in 1940, where she was the first and only woman. Edinger became a citizen of the USA in 1945. She continued her work on fossil brains for over twenty years and published a landmark book on the evolution of the horse brain and many controversial articles, as well as comprehensive bibliographies of her field. In 1963 Edinger was elected president of the SVP; she was the first woman to serve in this role. Edinger died in 1967 as the result of a traffic accident at the age of 69. Her final book: Paleoneurology 1804–1966, was completed posthumously by her colleagues and is considered the essential starting point for any project in palaeoneurology. Buchholz, E. A. and Seyfarth, E. a. 1999. 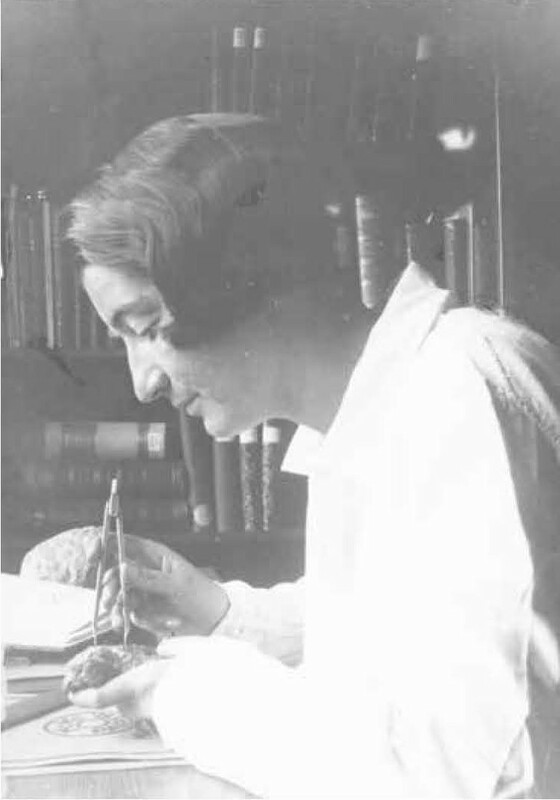 The gospel of the fossil brain: Tilly Edinger (1897–1967) and the science of paleoneurology, Brain Research Bulletin. 48(4), 351–361. Buchholz, E. A. and Seyfarth, E.-A. 2001. The study of fossil brains: Tilly Edinger (1897–1967) and the beginnings of paleoneurology. BioScience 51(8), S. 674–682. Edinger, T. (ed.) 1948. Evolution of the Horse Brain. Geological Society of America Memoirs, 25, 1–177.